Storage space is a high priority in my shop. Maybe in yours too? 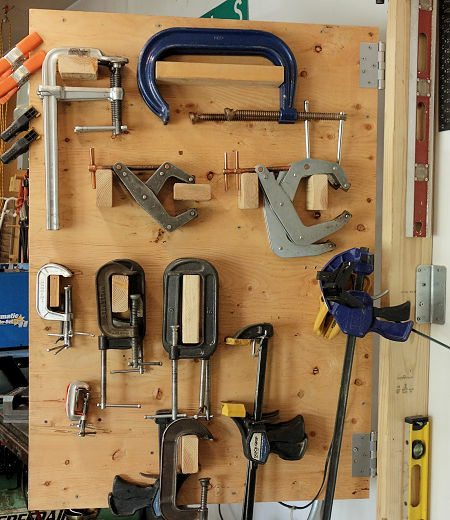 It’s not that there is not enough space, it’s the prime space where tools are super accessible for any moment you might need them. This is particularly true for tools I use frequently, so I’m keen on great ideas as a storage solution. Clamps — C-Clamps, Scissor Clamps, Bar Clamps — fit that category for me. I used to keep them in a bucket, which was a great storage solution because you could easily carry them all to your workspace. But, it seems they are always hooking on each other. I had one bucket for large clamps and another for the small ones. Even with that, the one I want is inevitably at the bottom, under the others. One day I just said “Enough!” I’ll keep buckets for transport, but in the shop I need a better way to store and access clamps. I need something clean. 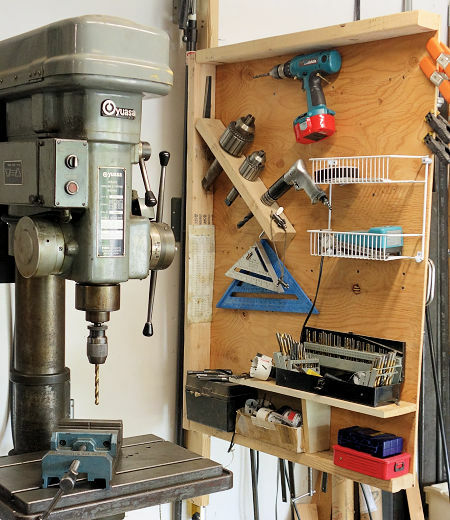 Turns out, I was also noodling about drill access and storage since I want the drill bits right at my fingertips when I’m using the press, but I don’t want them cluttering the workbench or off on a distant shelf. I considered shelves on the wall behind the drill press, but that means reaching over for drills. Again, I want something clean. It was pondering the combination of the 2 ideas that spurred this “Tool Door” storage Solution! I’ll build a fold-away prime storage space near the drill press and put the drill bits on one side and the clamps on the other. I’ll make it fold against the wall when not in use, or when I want something big on the drill press. This arrangement gives easy access to the drills right by the press when I’m working on small things. Then, when I need some added space for big stuff — like drilling on long parts — the “tool door” just folds out of the way. On the back side, when the door swings out, the clamps are in view. Beneficially, the clamp side is my workspace for bigger projects like trailer frames. That is where I use clamps the most anyway. The Tool door hangs on one 2×6 bolted edgewise securely to the back wall. Several metal angle brackets anchor it with long, strong screws. It hangs on a stud in the wall (actually a double stud). 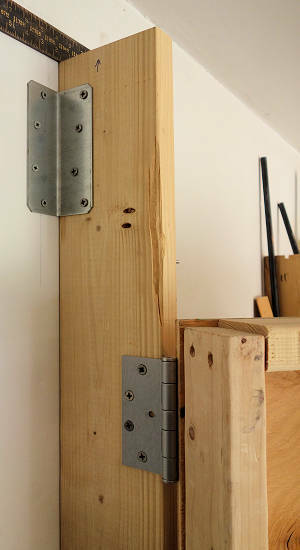 The long 2×6 and the brackets support the weight whether sticking out, or folded against the wall. Orientation of the 2×6 and hinges allows space for the clamps between the tool door and the wall when the door folds all the way back. A 2×4 framing around three sides of the plywood gives rigidity. Next, I put all the additions for the storage solution on a piece of plywood with arrangements for the tools. The plywood becomes the “Tool Door” with a couple of stout hinges — because that stuff is pretty heavy. The hinges are separated as much as practical for mechanical advantage by spreading out the load to the wall. Also, the position of the hinges with respect to the door and the 2×6 puts the screws in shear more than pulling on the threads. I suppose if I had more time and patience, I could paint it. Or, I could paint outlines of the tools or something and make it look nicer. Oh well. The drill and clamp storage solution works well just like this. I would make the 2×6 on the wall go all the way to the floor so weight of the tools and door is on the floor. The wall would have less stress by only holding tilt forces. It’s not a big deal, but it’s something. I would use a 2×8 against the wall for a little more space when folding the tool door closed. Mostly it works fine, but it would be nice for closing when things are against that wall. This is another post in our Solutions! Category. Don’t forget, this is your place to share. All our readers would love to see what you create as solutions in your shop. Please submit your stories here. Thanks!